While free motion quilting (FMQ) my king size quilt, I realised that my sewing machine (my Jag) needed some TLC. I clean it on the first of each month but otherwise I haven’t done any maintenance on it since I got it two years ago. It was past due. I brought it in this morning and I will hopefully get it back next week. I’m sure that many of you understand my anxiety of being without it for long. I do have 2 Kenmore machines that are old but fine, although they will require some maintenance also. As my pile of projects to FMQ is getting higher, I really need my Jenome to be in great working order. I could bring one of my Kenmores upstairs and work on piecing projects. I have many to choose from. These are a few of the blocks from Grandmother's Choice Block of the Week, It was created to recall the fight for women's rights. 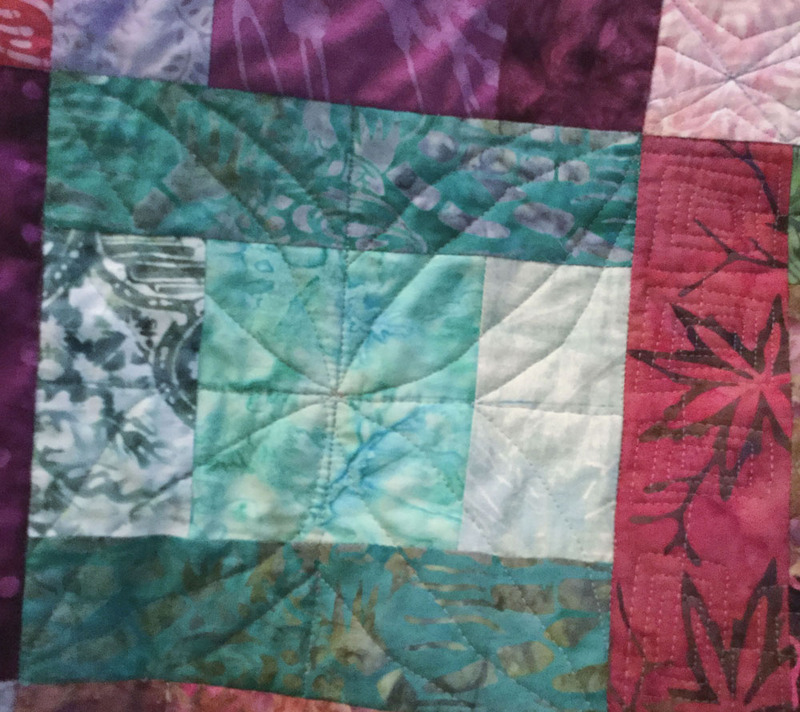 Since this year is the 100th anniversary of women obtaining the vote in many of Canada's provinces, it would be really nice to finish the quilt this year. 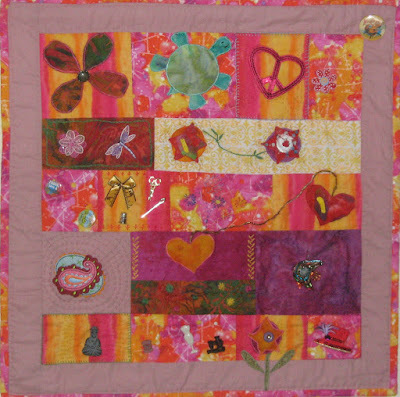 This quilt is my interpretation of Street Art Quilt which appeared in the International Quilt Festival Quilt Scene magazine (2013\2014), My version is totally different that the original and I would like to make it bigger. I don't think it would take much work. 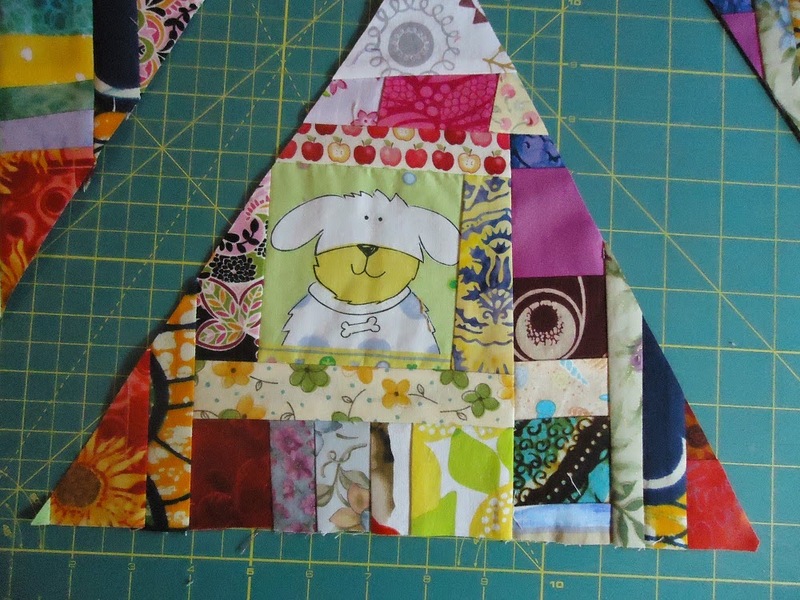 I have 22 very scrappy triangles that need to be set into a quilt. All I need to do is cut triangles of the same size and make the quilt! 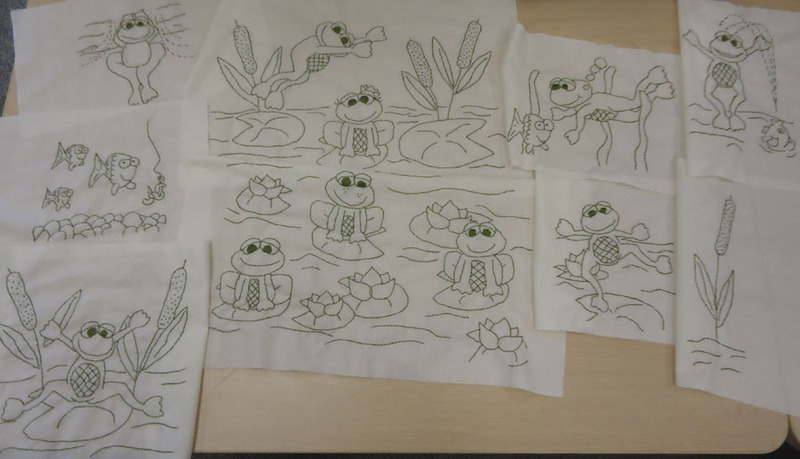 All of the embroidery is done for my Frog Work quilt below. I just need to piece a few more blocks. I can also forget the sewing machine for a week and work on hand projects. I have a couple of these and there’s a project that I’d love to start. Since I am going away on the weekend, it would be great to have some hand work to do. I also have some miscellaneous tasks like sandwiching quilts to get them ready for FMQ; frame my felting project or even clean my sewing space! I've bought a frame - maybe it's time to see if it fits and would look good! I started this post by going through my blog to see what projects I could work on. 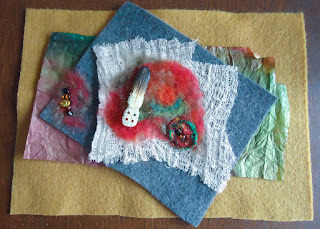 I do have a list of projects that I've completed and that I'm working on but going through the blog was much more visual and fun. As I was deciding on which projects to include, I had some pretty strong negative reactions to a couple of them. I guess it's not the time to go back to those yet! I've got three options but these's no reason that it has to be either/or. A combination of all three would be just fine (and more likely). As I look at these projects, it feels like when I'm getting ready to go on retreat and want to bring everything and will end up bringing too much! Whatever gets worked on is a bonus. There are no deadlines for any of these. So, do you have projects to finish this summer, and are you diligent about getting your machine maintained? I'd love to hear from you. From the first Thursday of each month until Sunday, Jenn at a Quarter Inch from the Edge hosts Throwback Thursday! Linky parties. This is where bloggers write about a quilt that was made way, way back. Since I haven't been quilting for that long, for me way back means BB - before blogging. My Colours is the first art quilt that I designed and made. I wanted to make a quilt that represented ME! 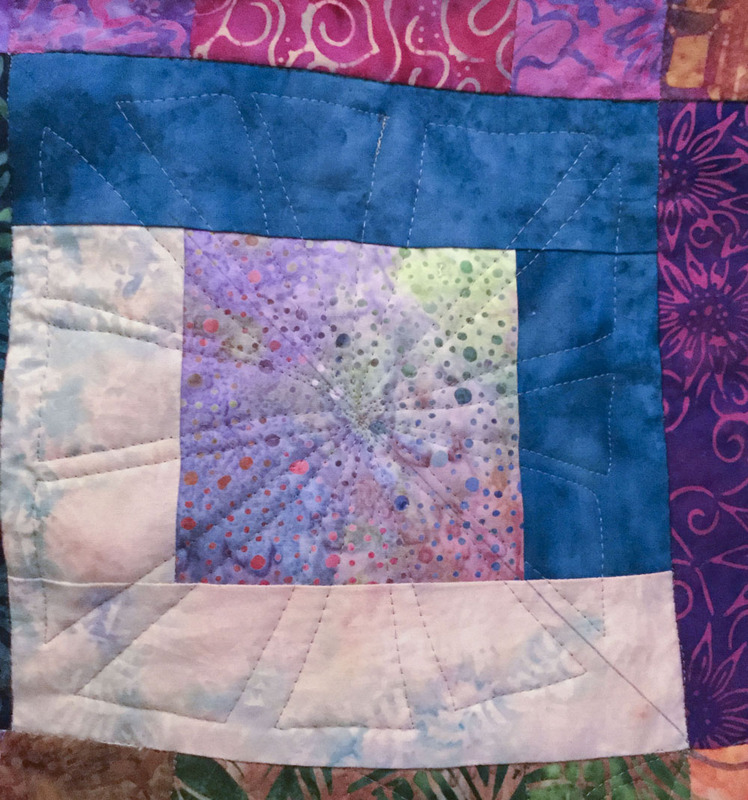 My intention was to have it look like a crazy quilt. I did use embroidery and embellishments, but the shapes are mostly rectangular, not crazy. I used some very funky and colourful fabrics. Not bad for a very small fabric stash. Each block represents something about my personality or my life. There were a lot of flowers since at the time I did a lot of gardening. That was before I got totally addicted to quilting and gave up on my garden. 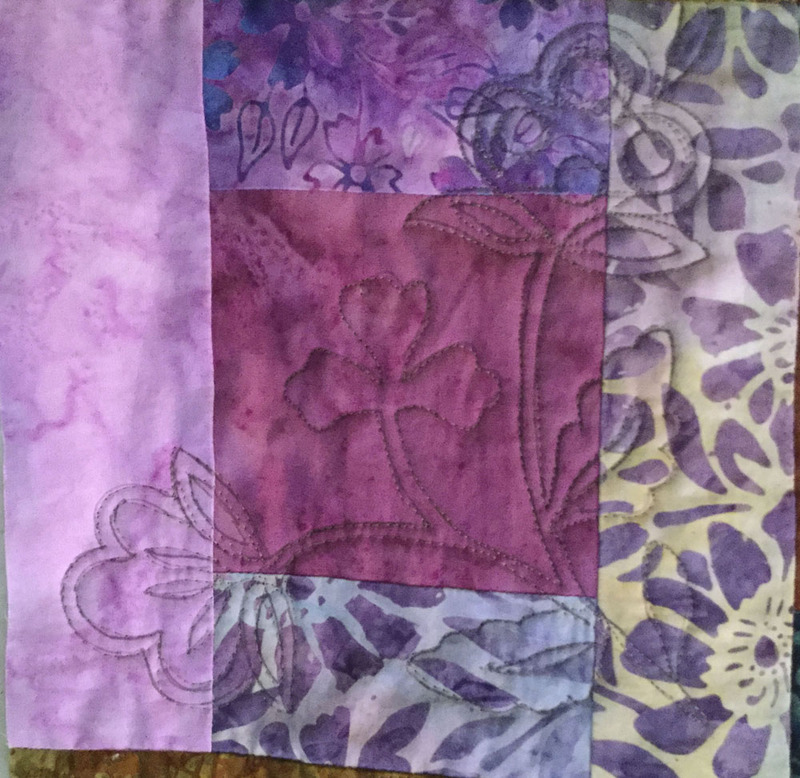 It turns out that the results of my quilting were much more predictable than my garden! There were also many hearts and symbols of peace - for the hippie that I am, even if I was born at least 10 years too late. I had a great time shopping for things to include in the quilt. I found a beautiful red hat - for the woman that I am becoming as I age. There were also cool decals and buttons about quilting and nature, including a beautiful glass fish pendant. 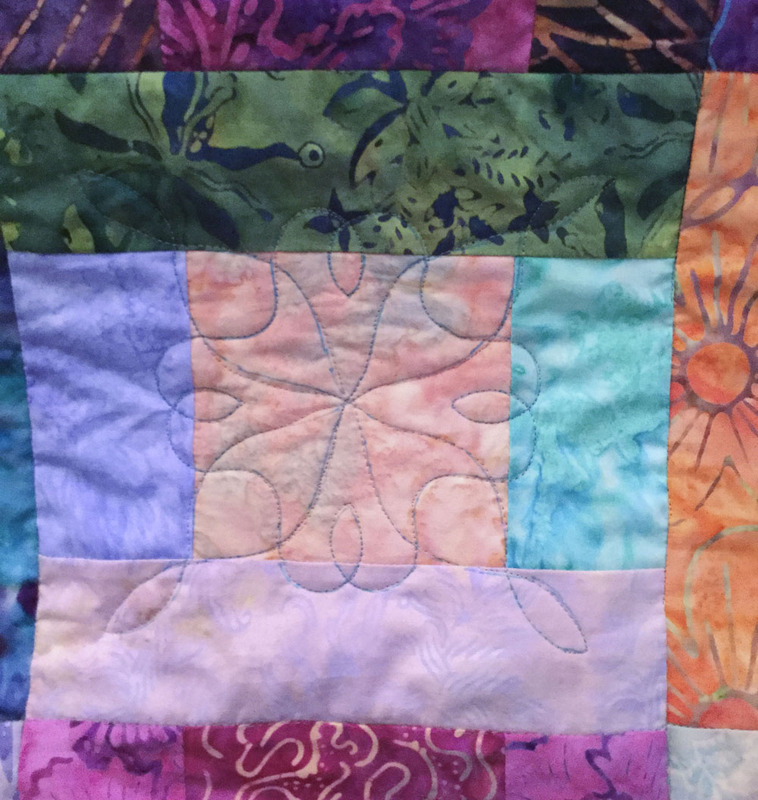 Many of the blocks were embroidered in the crazy quilt style. The entire piece was hand quilted in different coloured thread. It was one of two quilts that I exhibited in my first show with the Common Thread Quilt Guild in 2010. Even after all these years, this quilt still represents who I am. For many years this wall hanging was in my cubicle. Unfortunately our new cubicles have very little wall space so it's now at home. 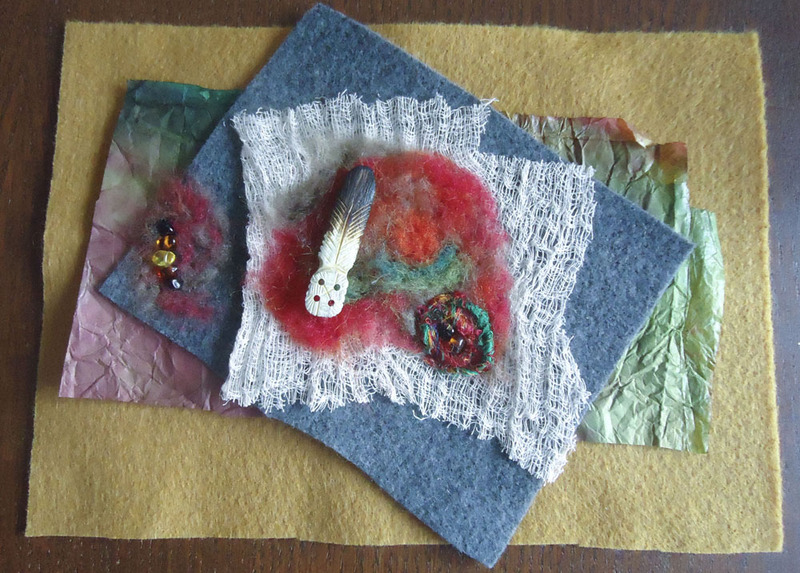 It had continued to evolve - it has a few more buttons and some postcards pinned to it. 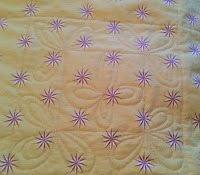 This was quilted by hand, before I had a sewing machine that FMQ. It would have taken me much longer to make. 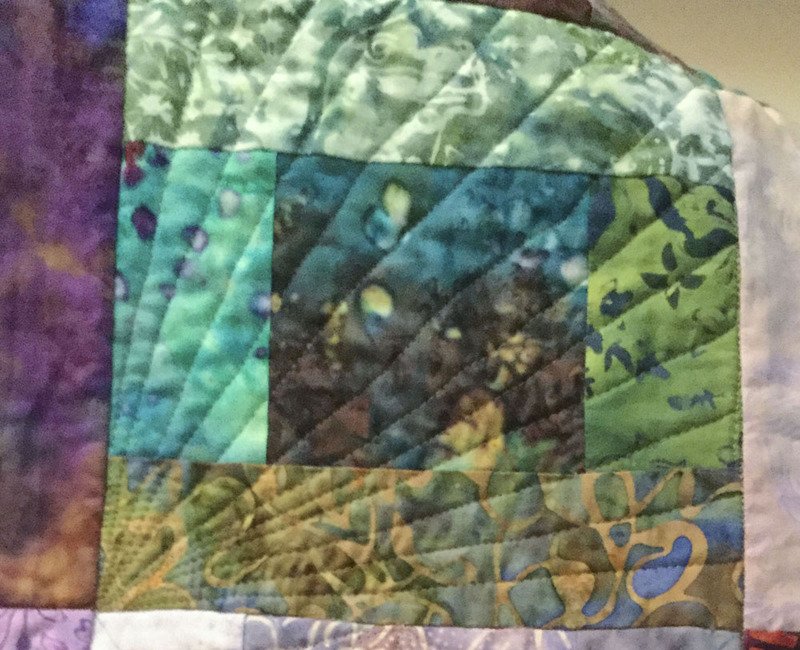 Labels: 30/30 sewing challenge, A Successful Quilt Show, Appliqué, art quilt, embellishment, Embroidery, hand quilting, Throwback Thursday! Only 146 blocks to go! 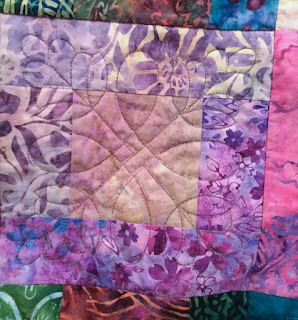 Many years ago I fell in love with the Splashes of Color quilt at allpeoplequilt.com – with a simple pattern of pastel batiks, it looked both soft and yummy! Perfect for sweet dreams. Over the next few months I made the quilt. When it was finished, I was disappointed. It didn’t look like the quilt that I had fallen in love with. I put it away since I wasn’t ready to quilt it yet. 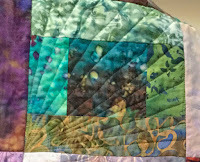 I didn’t have a sewing machine that did FMQ and I was told not to hand-quilt it since batiks are dense and difficult to hand-quilt. About a year ago I found the batik quilt top. With trepidation, I unfolded it and lay it over my bed. Wow! It was stunning! It may not have been the soft quilt I wanted but I love it! On my king sized bed I noticed that it almost fit. 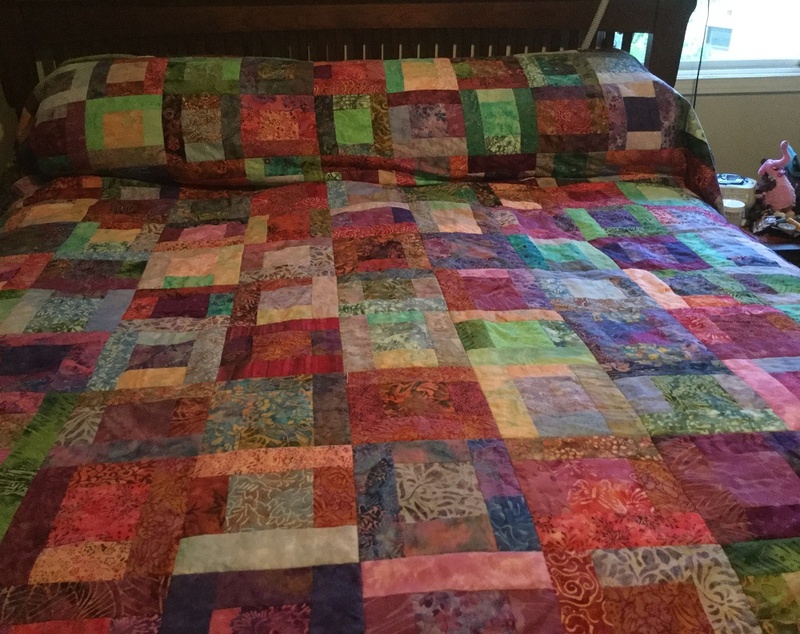 I showed it to my husband who liked it, so I decided to finish this quilt for our bed. 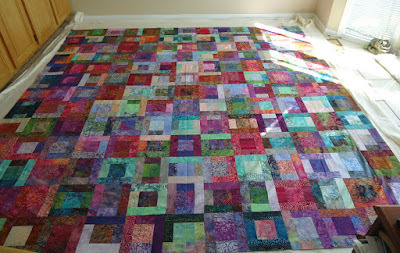 At a retreat I made a few more rows so that I wouldn’t have to fight my husband for my share of the quilt as we slept! I bought some Tula Pink fabric for the backing as well as king-size batting. I was now ready to sandwich this monster. One day when I had the house to myself, I removed all of the furniture from our kitchen eating space, vacuumed and then lay down the batting. It took the whole space! It's the size of the kitchen eating area! Chevy in the middle of the action! It was a rather long and tedious process. 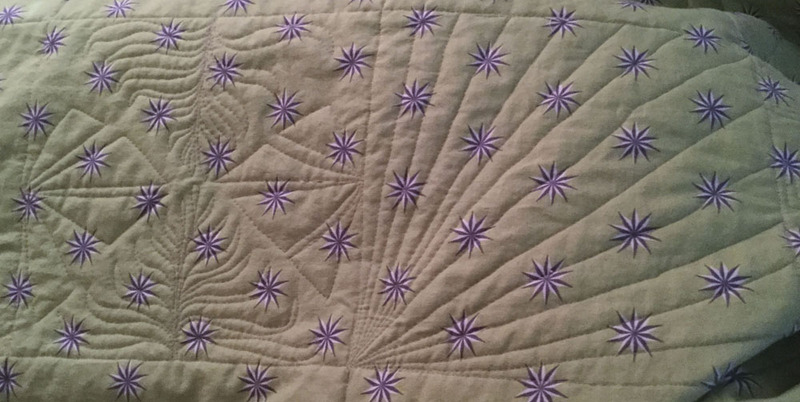 I placed the quilt top on the batting, tapped the top to the floor, pinned it and then flipped it over. I did the same to the backing. When it was pinned to my satisfaction, I put the table back, sat down and basted the sandwich together. 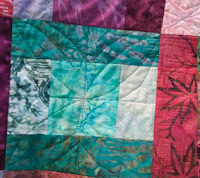 I then quilted every block. 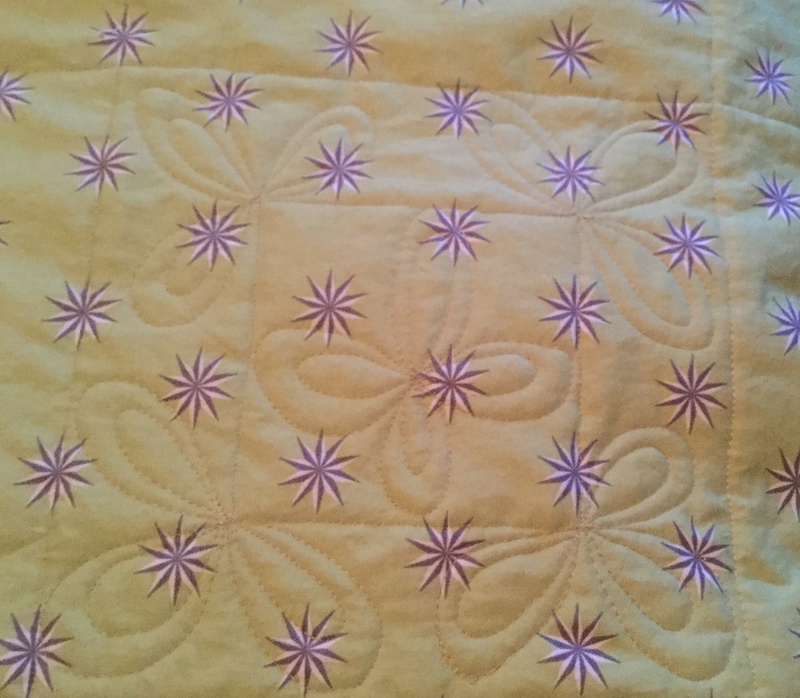 This helped to stabilize the quilt and I was happy to see that I had done a good job of sandwiching the quilt since there was very little puckering. I FMQ (free motion quilted) between the blocks using Superior Thread’s Bottom Line in both the bobbin and top. 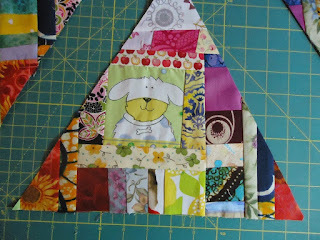 I wasn’t sure what thread to use for the actual FMQ of each block but decided to keep using the Bottom Line. It’s very fine and won’t take attention away from the quilt itself. Besides, every block has different colours – changing and deciding on the colours of the thread to use in each block would have been impossible. 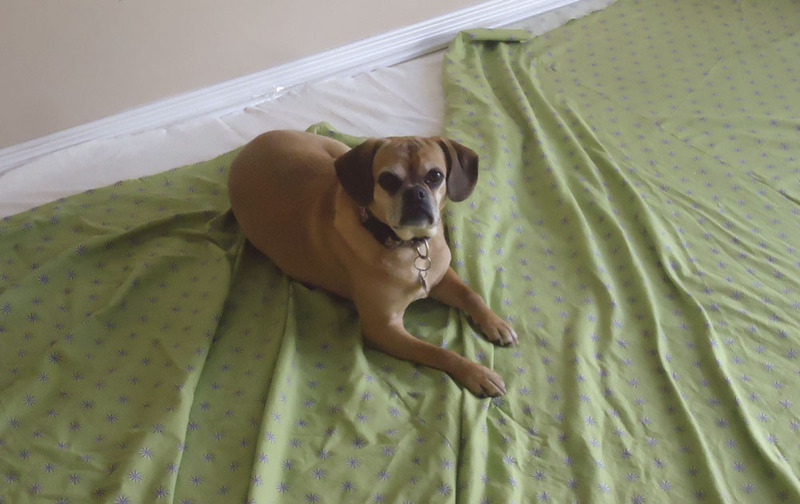 It can be a stenciled pattern, a dot-to-dot pattern or anything else that fits the above criteria. 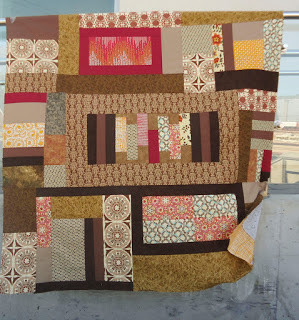 Since there are 169 blocks to FMQ (13 x 13) this will give me plenty of opportunity to practice these designs. 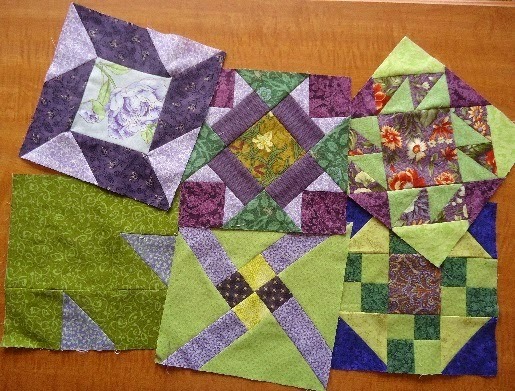 Here is a sampling of the 23 blocks that I’ve done so far. 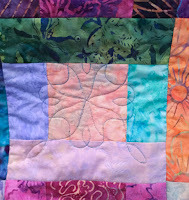 The stencils are mostly from The Stencil Company while many of the FMQ comes from Angela Walters' Shape by Shape book. The marking on each block hasn't been ironed off yet. 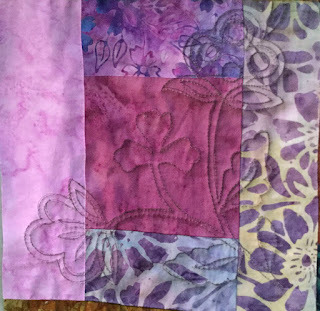 You won't get a soft pastel quilt if your fabrics are dark! Beware of those expectations. Allowing time to pass can help you change your perspective. I have done some FMQ designs that really don't show well, but it's good practice and they are very lovely from the back (see the picture below). This is an excellent way of practicing my FMQ. The blocks are not perfect, but the overall effect will be stunning I'm sure. These blocks are very time consuming. I've put the quilt away for now so that I can work on other projects. Chevy wants to be included in the pictures - besides, pictures with animals are always popular! Only 146 blocks left to go!